We didn't have to go this far back in time, but...sigh. Anyway, this IS a story about singing, so work with me. 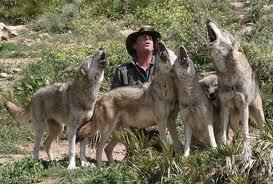 This is more like the singing group you should be picturing. 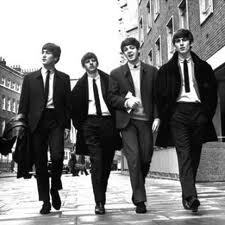 The Not-So-Fab-Four. What do characters in a hokey Hollywood musical and a small church choir have in common? Heart, that’s what. With the odds against them, tons of drama and a lot of hard work, the ending is nothing short of astounding. Maybe it’s great in Hollywood musicals, but I’ve found that being astounded isn’t always a good thing in my life. 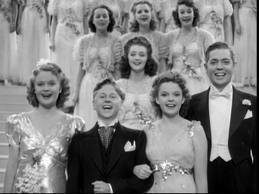 Take Babes in Arms starring Mickey Rooney and Judy Garland. Mickey plays a plucky guy conveniently named Mickey. He’s a tough-nut that comes from show-biz stock and wants to be a star; but he, Patsy (Judy Garland’s character) and some other hooligans are sentenced to school so they can become honorable citizens like bankers and politicians. Mickey cooks up a scheme to avoid education. He has one month to convince the judge that these spirited scallywags belong in show business, not respectable society. They didn't need school when they had street signs like that to support them. How does Mickey do it? He puts on the show to end all shows. They’re poor as dust, but willing to work hard. With the help of kind town folks and mammoth Hollywood magic, they produce a show with glittering costumes, elaborate set designs, a cast of hundreds and a full orchestra. The only trouble is Mickey’s ego. 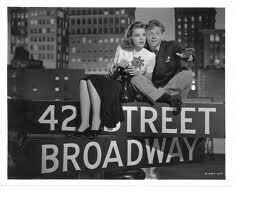 He’s torn between the heady lure of guaranteed fame and keeping his velvet-voiced sweetheart Patsy. The suspense is almost too much to handle. Chuck’s Methodist rural church choir didn’t have Mickey Rooney, Judy Garland, or mammoth Hollywood magic. It had eleven well-intended, devout volunteers on the best days and five or fewer on the worst days. The only qualification for being in the choir was the desire and courage to sing. Being able to walk to the choir loft and stand and sit without assistance was also a plus since most of the choir members, unlike Mickey’s crew, were Medicare-eligible. The Soprano section soothing their vocal chords before rehearsal. Most of the choir members couldn’t read music, either—not because of impaired vision, but because of impaired or missing musical training. Some members sang by memory and another only sang her favorite notes. Off key. We rehearsed for forty minutes before the service for the music we sang that morning. Sometimes we rehearsed pieces for future weeks, but not always. Musically, we were on the “it’s better than listening to another sermon” side of pathetic. But we had beautiful robes, making us appear melodious, pious and prepared. Choir Director tried to stay calm in the face of what he saw as a brewing storm. Chuck said, “You never know what we can do until you challenge us. We’re ready for a challenge, aren’t we?” He looked around the choir loft. Some of us were nodding enthusiastically and others had a wide-eyed look of either confusion or optimism; it was hard to tell. The choir director gave up agreed. 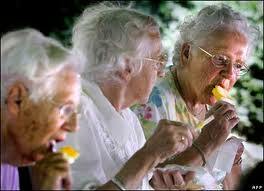 Since the average age in our choir was 75, we simply smiled and nodded in thanks. Mickey’s gang would’ve jumped and cheered; that kind of behavior in our choir could’ve caused a cardiac calamity. We couldn’t afford to lose anyone due to joy. Choir Director chose A Simple Praise for our “someday anthem.” He played it for us; we listened. It was beautiful and had a few key changes and some odd harmonies. Perfect. He began with the sopranos, who had the melody for most of the song. 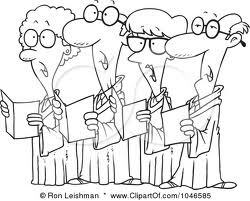 Over half of the choir sang soprano because they got to sing the melody, not because their vocal range was high. Most were women, but we had men who sang the melody an octave lower. I was the only soprano who comfortably sang at or above the top of the staff. On pitch. On good days. “Pitch,” outside of baseball and barnyard work with hay, was a foreign concept to that choir. Another view of the sopranos. From a distance, we don't look as old. I'm the one on the far right. The sopranos sang through the first two pages. The piano stopped; most of the sopranos didn’t. They each ended in their own time and on various notes. I heard a faint, pained sound from Choir Director, who was usually such an optimistic fellow. “What’s that?” one of the sopranos asked me quietly, pointing to a half note. “That’s a half note,” I said. We had all kinds of heart…and pace makers, too! Nice post! It’s hard to be part of something that doesn’t quite measure-up. Can’t wait to see what happens. & I’m so glad I stopped by….. Yes a fine read but guess what? Yes, and the story has only just begun. Oh good, you’ll like what’s coming next, then! Yeah, I’m having some of PTSD myself. But, by golly, we had heart! This caused some traumatic flashbacks for me of my days in a church choir. Oh well, that’s what the Xanax are for. The wolves should cut a demo. LOL! I am a horrible singer but love to do it. I try to confine it to the car though. 🙂 Charming story! I can read music, but can’t hold my pitch worth a darn. I sat between one person who was always sharp and another who was always flat. Oy vey! Very funny post. I loved the captions under the photos. Oh, the stories we have about church choirs, those of us who’ve been through it. (I was the organist). Oh dear. I’m musically illiterate so I shouldn’t laugh. But I did. Great post – I especially love the photo of the soprano section soothing their vocal chords! Love this post! I would be the person asking “What’s a beat?” I can’t read music, but I sure can sing to the top of my lungs. Parties are my favorite. That way I can sing with wild abandonment….badly….and blame it all on the alcohol. I got this. Looking forward to this storyline. Thanks Lorna! Since I married the man who volunteered to be choir director (for 40 years) and got roped into rejoining the choir, (I sang for years before he became director and I went off to grad school) I laughed through this whole post. Especially the ones who sang off key and didn’t know the music.